As a range of climate change mitigation scenarios are discussed, Univ. of Washington researchers have found that the injection of sulfate particles into the atmosphere to reflect sunlight and curb the effects of global warming could pose a severe threat if not maintained indefinitely and supported by strict reductions in greenhouse gas (GHG) emissions. The new study, published Feb. 18, 2014, in IOP Publishing’s journal Environmental Research Letters, has highlighted the risks of large and spatially expansive temperature increases if solar radiation management (SRM) is abruptly stopped once it has been implemented. SRM is a proposed method of geoengineering whereby tiny sulfate-based aerosols are released into the upper atmosphere to reflect sunlight and cool the planet. The technique has been shown to be economically and technically feasible; however, its efficacy depends on its continued maintenance, without interruption from technical faults, global cooperation breakdown or funding running dry. According to the study, global temperature increases could more than double if SRM is implemented for a multi-decadal period of time and then suddenly stopped, in relation to the temperature increases expected if SRM was not implemented at all. 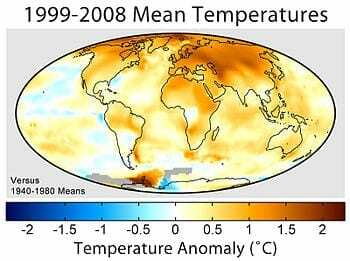 The researchers used a global climate model to show that if an extreme emissions pathway—RCP8.5—is followed up until 2035, allowing temperatures to rise 1 C above the 1970–1999 mean, and then SRM is implemented for 25 years and suddenly stopped, global temperatures could increase by 4 C in the following decades. This rate of increase, caused by the build-up of background greenhouse gas emissions, would be well beyond the bounds experienced in the last century and more than double the 2 C temperature increase that would occur in the same timeframe if SRM had not been implemented. On a regional and seasonal scale, the temperature changes would be largest in an absolute sense in winter over high latitude land, but compared to historical fluctuations, temperature changes would be largest in the tropics in summertime, where there is usually very little variation. April 17, 2019 - Climate ‘Realists’ Are Delusional MotherboardSo-called “realistic” responses to climate change don't literally refer to what's possible. They just refer to what maintains the political status quo. April 1, 2019 - Climate Change Is Perilous, and Geoengineering Is Cheap. What Are the Risks? BRINKWhat level of consensus is required for use of a technology that could alter the climate of every nation? April 13, 2019 - Longshot presidential candidate Andrew Yang thinks rogue geoengineering could cause a war. He wants the US to take the lead before it happens. Business InsiderIf the US doesn't take the lead on geoengineering, another country like China will, according to longshot presidential candidate Andrew Yang. A roadmap for responsible geoengineering research?